Generating a comprehensive, safe and cost-effective approach to demolition, dismantlement and decontamination while surpassing environmental regulations. In April 2017, the water industry in England begins to deregulate and the barriers to competition start to come down. If you are a business, charity or public sector organisation, it means you will be able to switch the retail part of your water services to your choice of service provider. From 1 April, you will be a free agent – you will be able to switch your water supplier whenever you choose. 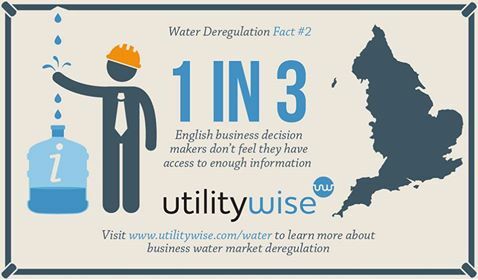 Only 1 in 4 English businesses are informed about the upcoming water deregulation, and many don’t understand the potential benefits of this change in the market. Find out more about the changes in the English water sector through this notice and these Q&As from UtilityWise. Click on the image below to see the infographic (1MB). The retrofitting of existing buildings to greener standards is widely recognized as a key step in the sustainable development of a nation’s economy. RetrofitTech UAE Summit & Awards will give an update on UAE’s retrofit programme for buildings to lower water and electricity demands, identify upcoming projects and requirements, and give a snapshot on the emerging opportunities in new sectors or markets through innovative conference formats. Following the earlier interview; NRG Expert analyst Edgar van der Meer rejoined share radio on Monday to discuss nuclear energy’s future. Listen to the clip in the link below. His Excellency U Ohn Win, Union Minister for Natural Resources & Environmental Conservation to Open CMT’s 3rd Myanmar Mining Summit in Yangon. Tulsa, OK, USA (1 September 2016) – The Offshore Technology Conference’s (OTC) 2016 Arctic Technology Conference (ATC) has announced its 2016 Distinguished Achievement Award honorees for the Individual and the Companies, Organizations and Institutions Categories. Awardees were unanimously selected by the ATC 2016 Awards Committee, led by ATC Oversight Committee Chairman Brian Miller and OTC Board Member Norman Carnahan. ATC will recognize Göran Wilkman for Individual Achievement and the 2015 Shell Alaska Exploration Program for Companies honors. The recipients will be recognized during the ATC 2016 Distinguished Achievement Awards Luncheon on Tuesday, 25 October, during ATC in St. John’s, Newfoundland and Labrador, Canada. CDMC Events, as the organizer of The 13th Deepwater Asia Pacific（DAP）2016 are glad to announce that Consulate General of the Republic of Indonesia in Shanghai has made an agreement being our supporting organization. Consulate General of the Republic of Indonesia in Shanghai will not only serve as a wide and reliable platform for Oil & Gas information exchange and networking but also an opportunity for sharing knowledge and practice on Oil & Gas industry. Pertamina (Indonesia National Petroleum company)、SKK Migas (Indonesia Oil and Gas Special Task Force)、Petronas (Malaysia National Petroleum company)、Shell and Chevron will attend the conference. The preliminary draft for China’s energy Internet action plan has been completed with the formal plan likely to come out within this year. The energy Internet related market scale is expected to exceed 5 trillion yuan, predicted industry insiders. The combination of energy and Internet has become a mainstream thinking under the country’s “Internet Plus” strategy and China is likely to encourage various pilot projects to achieve higher efficiency in using renewable energy such as wind power and solar PV power in a bid to replace polluting coal, according to an informed source. At the end of 2015, Australian rooftop solar system installation has exceeded more than 1.5 million households. The electricity price is 5-8 Australian dollars points and in this case, the number of users increased ten thousand per month. About 1.5 million kWh of energy storage market can be expected, while the government photovoltaic (PV) subsidy contract covering 300 thousand users will expire in 2016. In 2017, the small energy storage system with the rooftop PV system will have a installed capacity of about 500 thousand kWh. By 2020, the retail price of the small energy storage system is expected to fall at 0.9 Australian dollars/ Wh, according to the authority of AEMO (Australian Energy Market Operater). FPSO market is still encouraging in the long term: a positive outlook remains with potential orders for $80-$120 billion from 2015 to 2019. North Yorkshire County Council is starting its planning committee process to decide whether fracking will be allowed in the area. So what are the latest pros and cons of shale gas excavation that have left local councils in tricky situations? Matt Cox has been hearing from Edgar Van der Meer, Senior Analyst at the independent energy market research company NRG Expert, to find out. Listen to the interview here. Outages are among the largest expenditures for power plants and operations are continuously faced with immense pressure to successfully plan, execute and recover from outages with limited resources. Focusing on running outages cost-effectively and efficiently without sacrificing operational excellence, proves to be repeatedly unpredictable and challenging. As outage management techniques continue to evolve and improve, it is vital that aging facilities integrate with new technologies to optimize costs and gain the most value from plans. MiFID II will have a significant impact on the energy market, and there are a number of unique challenges that will need to be appreciated by market participants if they are to comply with the latest developments that have been made in this area. Ahead of The application of MiFID II for energy trading Conference, we spoke with Nikos Triantafyllidis, Group Financial and Energy Markets Compliance Manager at OMV, who analyses the best practices in implementing the ESMA draft tests as well as the latest developments in RTS 20. For the last 7 years, the marcus evans Chem/Petrochem & Refinery Shutdowns and Turnaounds Conference has been one of the most anticipated STO meetings in the industry, bringing together professionals & plant managers to discuss key fundamentals for achieving the utmost efficient shutdown /turnaround operation. The conference provides attendees with proven solutions in timely maintenance planning/scheduling and improving communication between O&M. New Orleans, LA– April 5, 2016 – marcus evans will host the 15th Outage Management for Power Plants (OMPP) Conference on July 26-28, 2016 at the Astor Crowne Plaza in New Orleans. As it has for more than over a decade, this annual meeting provides power generation professionals with proven case studies on how to run outages efficiently without sacrificing operational excellence. International Business Times – STEUBENVILLE, Ohio — Danny Hepburn hops into the cab of a rumbling white semi-truck, the words “Student Driver” emblazoned on the back in black block letters. An instructor rattles off the list of switches and gauges to review before Hepburn steers the beastly vehicle around a snow-covered parking lot. Hepburn, who was laid off twice last year at a nearby coal mine, is here to learn the trucking trade. Amman (January 25, 2016) – Day one of Solar & Wind Projects Jordan conference at Sheraton Amman Al Nabil Hotel brought together government authorities, investors, developers, consultants, EPC contractors, financiers, legal firms and technology providers to discuss future plans, regulatory updates, procurement models and construction strategies to deliver solar and wind projects leading up to 2020. This conference is organized by Advanced Conferences & Meetings (ACM). The conference started with the opening remarks of the chairman Eng. Mohammed Al Ta’ani. H.E. Dr. Taher Shakhshir the Minister of Environment delivered the keynote address followed by an overview on the Ministry of Energy and Mineral Resources’ agenda for solar energy by Dr. Mohammed Al Dabbas, Minister’s advisor for Energy Affairs from the Ministry of Energy and Mineral Resources. Dr. Wijdan Al Rabadi shared a presentation on behalf of EMRC about shaping RE policies and regulations in the Jordanian electricity sector. Whilst Mario Campo from ABB shared a presentation on enabling the power of renewable onshore wind& PV solar grid integration. Jyrki Leppanen shared a presentation on optimized solutions for PV power plants. At 09:55 the industry panel: current challenges for local and international solar developers started with Mr. Walid Shahin as moderator and Hanna Zaghloul, Eng. Ahmad Halaiqah and Ennis Rimawi as panelists. Eng. Yacoub Marar shared an overview on the agenda for wind energy by the Ministry of Energy and Mineral Resources. Another interesting presentations on Jordan Renewable Energy & Energy Efficiency fund programs and projects and PV Soiling Loss in the Middle East Region were delivered by Dr. Rasmi Hamzeh and Dr. Fred Chen respectively. Sean Miller elaborated on JWPC update on the Tafila wind farm project whilst Patrick Jaeger shared a case study on the latest project development & financing trends. And finally Eng. Muhieddin Tawalbeh and Eng. Emil Alasis shared a presentation on NERC’s update on the WECSP pilot Plants. This is a great opportunity not to be missed by solar and wind experts and professionals. Guest of honor Turkey / Two parallel congresses addressing both shallow and deep geothermal energy / Early-Bird Tickets until 29th of January. Accra, Ghana/Nairobi, Kenya, 14th December 2015 – Neoedge, a leading events company based in Singapore, will hold “Mastering Claims under the FIDIC Contracts” training courses in two venues: Accra, Ghana and Nairobi, Kenya. Over the next four years, Morocco’s Ministry of Energy will work towards meeting the government target of 6,000 MW of electricity generated by renewable energy with expected projects in the pipeline valued at USD 13 billion. Water Demand side Management GCC is a specialized conference addressing the implementation of performance enhancing SMART network solutions to optimize water consumption and improve water sustainability. This conference will take place on 7-8 March 2016, in Dubai, UAE. The GCC is an arid region with limited natural resources and a high cost of water production. Network managers need to work with the water resources they have available to meet the demand of water users. Supply of fresh water is an essential requirement for economic development and realization of the vision and mission stated by GCC leadership for future development will guarantee that demand will continue to increase. Egypt has more than 10 million streetlights, which use up around six per cent of the country’s electricity. These typically use sodium, mercury vapour, and incandescent lamps. To showcase the newest technology advancements along with the very latest project case studies, Advanced Conferences & Meetings is launching LightingTech Egypt conference on 9-10 December 2015 in Cairo, Egypt. Singapore, Singapore, 4 August 2015 – Neoedge, a leading events company based in Singapore, will hold Maintenance Management training courses in two venues: Johannesburg in South Africa and Port of Spain in Trinidad and Tobago. These Maintenance Management training courses will be relevant to Oil & Gas, Utilities, Mining, Petrochemicals/Chemicals, Manufacturing, Transportation, and Government Agencies as well. The upcoming events entitled, “Maintenance Management Master Class”, will identify the processes for implementing maintenance best practices as well as illustrate maintenance management principle through real life examples and case studies drawn from a variety of industries which are relevant to African and the Caribbean context. Saudi Arabia seems to see the writing on the wall when it comes to climate change, but experts think the Kingdom’s oil exports are too profitable for it to ever abandon the fossil fuel industry entirely. Johannesburg, South Africa 16th April 2015 – Neoedge, a leading events company based in Singapore, in partnership with Worley Parsons’ Principal Consultant and Advisian, Eric Khoo, is organising the upcoming international event “Gas/LNG for Power and Energy Markets Master Class” which will be held at The Capital Empire, Sandton, Johannesburg, South Africa, on 20-22 May 2015. Caribbean countries import nearly 99 percent of their energy, largely in the form of petroleum products. Two countries in the region, Venezuela and Trinidad and Tobago, have for years played a big role in covering the energy needs of the rest of the region. But with Venezuela experiencing an economic implosion, other Caribbean nations are looking for new sources of energy. DUBAI, UAE 18th March 2015 — The “Reward and Performance Management in Oil & Gas Master Class” is a well-researched event organised by Neoedge, a top events company based in Singapore. The forthcoming event will be held in Dubai, United Arab Emirates on 27th – 30th April 2015. The event agenda aims for its delegates to better understand how to manage reward and performance management in the oil and gas industry and to be responsible in the decision making at an operational, tactical and strategic level in HR, and, even to the support individuals or staff. World-class trainer & Project Management practitioner, Dr. Prasad Kodukula, will facilitate the event. Port of Spain, Trinidad & Tobago, 3rd February 2015 – Neoedge, a leading global business intelligence company, will present a four-day, intensive workshop to be held at the Hilton Trinidad and Conference Centre in Port of Spain, Trinidad & Tobago, on 24th – 27th March 2015. This event marks seven years of partnership between Neoedge of Singapore and Dr. Prasad Kodukula, PMP®, PgMP®, President, Kodukula & Associates, Inc., Chicago, Illinois, USA. Recognized by the Project Management Institute (PMI) as “Best of the Best” in project management, Dr. Prasad has been collaborating with Neoedge to offer methodologies, tools, and best practices to project, program, and portfolio managers through many parts of the globe. Endorsed by Ministry of Electric Power and hosted by CMT, 3rd MPS (Myanmar Power Summit) returns to Yangon on 9-11 March, 2015, to explore viable partnerships and investment opportunities in the country’s power-starved electricity sector. In collaboration with government’s aim to “power-up” the country, CMT & Myanmar Ministry of Electric Power will be hosting local private and foreign stakeholders for a timely discussion on Myanmar’s power generation and distribution plans. His Excellency Khin Maung Soe, Union Minister of Electric Power, Myanmar, will grace the summit with an opening address paving the way for the next session on ‘Electricity Act to Accelerate Expansion of Electric Power Generation Capacity & Delivery’ by a Senior Official from Ministry of Electric Power. Kuwait City – January 20, 2015. With over 70 confirmed speakers and a growing number of sponsors, exhibitors and delegates, the “Kuwait International HSE conference and exhibition” (KIHSE-2015) has consolidated its position as a leading world-class regional event in Kuwait. Held under the high patronage of HE Dr. Ali Saleh Al-Omair, Kuwait’s Minister of Oil and Minister of State for National Assembly Affairs; and hosted by the Kuwait Petroleum Corporation (KPC), KIHSE-2015 aims to promote Kuwait’s commitment to the highest standards of health, safety, and environmental (HSE) practices. Johannesburg, South Africa, 20th January 2015 – Neoedge, a leading business intelligence company in Singapore will host the event entitled: “Capacity Building for PPP Projects and Procurement Contracts Management Forum”, to be held in The Capital Empire Hotel, Johannesburg, South Africa this coming 24th to 27th March 2015. Read more. MOSCOW — In big Russian cities like Moscow or St. Petersburg, 30 percent of applications to connect to the electric grid are denied because the system of distribution wires hasn’t been upgraded in decades, according to one energy expert. Turn to solar? Not so easy; across the country, it is impossible to connect a solar panel to the electricity network. The technical specifications to feed electricity onto the network have never been written, and neither have the regulations to govern it, said another. Keep reading the article in which our Energy Analyst Edgar van der Meer is quoted. Rapid depletion and ageing of crude oil fields has been pressurizing oil producers to figure out new ways to acquire more oil from discovered oil & gas reserves. The growing importance of extracting oil from existing oil fields has led to continued growth, determining the Enhanced Oil Recovery (EOR) market development. A recent market report on EOR states that, the revenue of EOR technology is expected to reach USD 516.7 billion by 2023 and is anticipated to grow at a CAGR of 26.7% between 2013 to 2023. Addressing EOR Technological Developments till date, Fleming Gulf is organising the 3rd Global Innovative EOR Techniques Conference on 20 – 21 October at Le Royal Meridien Abu Dhabi, UAE. NRG Expert Analyst Edgar van der Meer is quoted in PM Network magazine discussing the implications of Chile’s renewable energy push on the project management and procurement markets. “The challenge is that the project management knowledge has to be imported.” Mr. Van der Meer is quoted as saying. He continues: “A lot of the projects that are being approved now are with foreign partners.” Read the full Article in PM Network here. Kuala Lumpur, Malaysia – 25 August 2014 – Neoedge, in cooperation with Beyond Budgeting Institute, is pleased to announce the first ever Beyond Budgeting Conference in Asia. The event is happening on the 9th October 2014 at The Royale Chulan Kuala Lumpur, Malaysia. That’s almost $ 800 million. But paid on Friday, at the end of the working day. And the claim that the money will be by Monday. Moscow has already said it has not yet reached a cent. Wait until Monday. And then – as appropriate. If the American industrial giant General Electric has a corporate doppelgänger in Europe, it is the German company Siemens. Both are global conglomerates that make trains, medical scanners and — most notably at the moment — the turbines and other equipment that generate and transport much of the world’s electricity. Keep up to date with the latest in energy news by downloading NRG Expert Talking Energy. This edition features news of Berkshire Hathaway’s energy expansion, revenue effects of price hikes by British Gas, and a new battery factory by Tesla Motors, certainly one of the more dynamically fluctuating energy stocks at the moment. Stay up to date with the latest energy news and developments by subscribing to our Talking Energy Newsletter here! 19th February 2014, London – Community energy schemes in the UK are on the up. Championed by the conservative energy and climate minister Greg Barker, supported by Britain’s first Community Energy Strategy unveiled last month and backed by councils across the UK, we are beginning to see a change in how we as a nation view energy management. NRG Expert discuss how the bankruptcy of one electric vehicle battery company has left the market wide open for new entrants. Analyst Edgar van der Meer of NRG Expert discussed the then upcoming meeting of OPEC speculating on the market and announcements to be made. With interests of members to keep the price oil stable at over $100/bbl there’s potential to see a dip in production. NRG Expert discuss market research into the Electric Car Battery market stating problems with current technology and expected figures in the market. Interest falls on figures suggesting 3.8 million electric vehicles will be sold in 2020 at the current growth rate. Statistics reveal the latest natural gas trends in the United States, covering natural gas production and consumption as well as import and export numbers. Global oil markets may see a considerable supply shock due to sudden surge in North American oil production, the IEA reports. It is expected that this new development will not only impact global investment but also oil transportation, storage and refinery industries. Researchers at the University of Wyoming have uncovered a massive deposit of lithium in the south western region of the state while investigating the possibility of storing CO2. Experts estimate that the area could contain up to 18 million tons, or the equivalent of 720 years of total worldwide production. Our analyst provides his take on one of the latest developments in wind energy. As grids are upgraded and new technologies are implemented, developments in the electrical supply industry will be more important than ever. With this in mind, NRG Expert has released the Electrical Supply Industry Database. NRG Expert Analyst Edgar van der Meer’s interview with TV Channel 24 Russia was recently picked up by LNG World News. Check out the article here. The renewable energy sector is uniquely positioned given the considerable government and public interest in its development. NRG Expert’s latest report investigates how, given this, it has fared during the global recession of 2008-2013. Analysts at NRG Expert, the energy market research company, have been following the concerning situation in California. NRG Expert announce the release of the Global Power Plants Database, providing energy intelligence on 24,000 power generation plants. Find out more..
Water mosaic commission by the charity OneDrop emphasizes how vital clean and safe water is for life in a creative and exciting way. Read more..
Electrical Transmission and Distribution networks are growing rapidly causing the power infrastructure market sector to also experience growth. As electricity networks expand and existing infrastructure ages, there is a growing market for retrofitting and refurbishment of the power infrastructure that supports it. Go to the full market research report…. To celebrate the festive season, NRG Expert launch a challenging energy quiz. They have scoured the NRG Expert website and over 1000s of lines of data in their global energy databases to ask 5 tough energy questions. Are you an energy expert? Do you know the answers? Click here to do the quiz! NRG Expert’s latest energy market research report on Smart Grids reveals how the introduction of smart grids has the ability to reduce CO2 emissions worldwide. NRG Expert looks at Australia’s renewable energy potential for investment and growth. Click here for more information. NRG Expert looks at their energy database and analyses Obama’s claim of doubling renewable energy in the US. Click here for more information. NRG Expert looks at India’s energy growth, highlighting key facts. Click here for more information. NRG Expert looks at Brazil and highlights key facts. Click here for more information. NRG Expert looks at China as a top country for energy investment. Click here for more information. By 2032 world electricity supply will not meet electricity demand. More energy must therefore be stored. In September, NRG Expert are pleased to announce the release of their latest Data of the Month on Energy Storage. Click here to download the full Energy Storage Report. Once considered too expensive to use on a large scale, the costs of desalinated water have declined. This is due to technological advances, improvements in energy efficiency and an increase in the lifetime of desalination plants. Read full article. Each month one of our experts highlights interesting facts from our latest reports. This month we look at the Global Smart Grid, a sector which is making governments, companies and investors sit up! Find out the key facts about this industry and get an insight into why the Smart Grid market is set to grow to over $100 billion by 2020. …with few projects commissioned and only in existing markets. However, this is not indicative of the state of the sector as a whole. As more money was invested in geothermal last year than the previous year. A new study by NRG Expert shows that the sustainability of the world’s energy supply is at risk, not only as population grows, but also as a result of depleted resources and the phasing out of Nuclear power in developed and developing countries. NRG Expert is launching a new series of weekly Natural Gas Forecasting reports under the brand name NRG Expert Tracker™. The reports provide a tailored weekly look at the US Natural Gas prices, providing the best possible advice on when to buy, sell and hedge. New NRG Expert “Utility Metering Deployment and Smart Grid Report & Database” reveals a strong metering industry in 2010 with worldwide growth to remain steady through 2014 and increasing deployment of Smart Metering technology. NRG Expert research reports are available to accredited journalists free of charge. Please note all NRG Experts reports must be properly sourced.